For our meeting Monday Dec 3rd 2018 we welcome, Columbia’s own, Mayor Stephen K. Benjamin to give us an update on Columbia!! Since being elected mayor in a record turnout election in April 2010, Mayor Steve Benjamin has made it his mission to create in Columbia the most talented, educated and entrepreneurial city in America. His service in Columbia started back in 1990 when he served as student body president at the University of South Carolina, later becoming the Student Bar Association President at the USC School of Law. At 29 years old in 1999, Benjamin was appointed to Governor Jim Hodges’ cabinet as director of the state’s second largest law enforcement agency, the Department of Probation, Parole and Pardon Services. In 2009, Benjamin drew national attention by representing prominent radio host Tom Joyner and securing a pardon for Joyner’s great uncles wrongfully convicted in the death of a 73-year-old Confederate veteran and executed in 1913. In a landmark decision, the South Carolina Board of Paroles and Pardons voted unanimously to grant the posthumous pardon, the first for South Carolina in a capital case. Reelected by a 30 percent margin in November 2013, Mayor Benjamin’s administration has been characterized by his firm belief in Columbia’s potential and intense focus on job creation. In his first term alone, his leadership helped cut unemployment in the metro by roughly half and secured billions of dollars in new regional capital investment in the midst of a national recession. 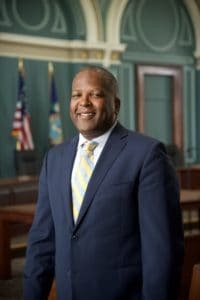 Mayor Benjamin is married to the Honorable DeAndrea Gist Benjamin, Chief Administrative Judge (Common Pleas) for South Carolina’s Fifth Judicial Circuit. The two are the proud parents of daughters Bethany (13) and Jordan Grace (10).